A Kirkus Best Book of 2018, Akissi: Tales of Mischief brings together the first volume of the hilarious and heartfelt Akissi comics by Marguerite Abouet, the award winning author of Aya of Yop City. Poor Akissi! The neighborhood cats are trying to steal her fish, her little monkey Boubou almost ends up in a frying pan, and she's nothing but a pest to her older brother Fofana. 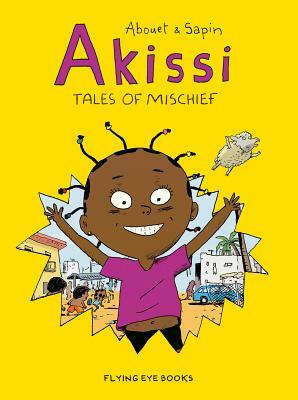 But Akissi is a true adventurer, and nothing scares her away from hilarious escapades in her modern African city. Jump into the laugh-out-loud misadadventures of Akissi in these girls-will-be-girls comics, based on author Margeurite Abouet's childhood on the Ivory Coast. Marguerite Abouet is a renowned writer from Abidjan on the Ivory Coast in West Africa. She started writing because she felt that comics weren't being written for girls, and wanted to change that. She is the author of the tremendously successful comic, Aya of Yop City, as well as the Akissi series for children. Mathieu Sapin was born in Dijon, France, in 1974. He studied in l'Ecole supérieure des Arts Décoratifs de Strasbourg before becoming a renowned illustrator for many children's magazines and publishers in France. Named to Kirkus Reviews' Best Books of 2018. ". . . utterly unputdownable. Based on Abouet’s childhood memories of growing up in the port town of Abidjan . . . the rapid-fire, action-packed tales are wild and antic. The colors are electric—purples, oranges, turquoises and bright yellows." "An unforgettable, boundary-busting, falling-over-funny collection." "Sapin’s richly colored artwork complements Abouet’s tales, which bring to life universal aspects of childhood, illustrating the silliness, resourcefulness, and mishaps that are experienced all over the world."